American politician, journalist, playwright, and philanthropist; born in Philadelphia, Pa., July 19, 1785; died in New York city March 22, 1851. 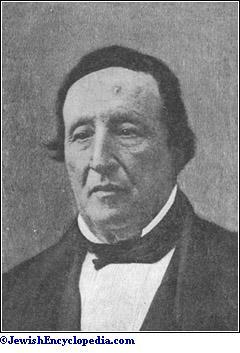 He was of Portuguese Jewish descent; and his father took an active part in the War of Independence. George Washington is said to have been present at the wedding of his parents. Left an orphan at an early age, Noah was apprenticed to a carver. He, nevertheless, managed to attend school for a few hours every day, and it was there that he met John Decatur and his brother Stephen, who later became commodore in the United States navy. Of a studious disposition, Noah spent his evenings alternately at the theater and in the Franklin Library, at that time frequented by the most prominent scholars and statesmen of Philadelphia, which city was then the capital of the United States. After spending some time in the auditor's office in Philadelphia, Noah in 1800 went to Harrisburg to represent a newspaper at the Pennsylvania legislature. This was his first attempt in journalism. Several years later he removed to Charleston, S. C., where he studied law, and where, his reputation as a prolific writer having preceded him, he was chosen to fill the post of editor of the local "City Gazette." The American political horizon was then clouded by the threatened war with England. Noah was among those who advocated war; and he wrote many a stirring article to this effect over the pseudonym "Muley Molack." In so doing he incurred the hatred of many of the oppositionists, and was even challenged to several duels, in one of which he killed his antagonist. The war with England broke out soon after, in the year 1812. The government at Washington, recognizing Noah's activity, appointed him in 1813 consul to Tunis. Just then the Algerines committed a most piratical act against America in capturing a vessel from Salem, Mass., and in enslaving its entire crew, consisting of twelve persons. Noah was instructed to adjust the affair with the Algerines in a manner that would redound to the honor of the United States and would strengthen American prestige in the Mediterranean. Above all, he was to endeavor to liberate the captured American sailors in such wise as to lead the Algerines to believe that the relatives and friends of the captives, and not the American government, were interested in their release. Noah effected this in a very creditable manner; but he was compelled to expend a sum exceeding the amount allowed him by his government. His political opponents at home made use of this incident to effect his recall. In Noah's letter of discharge, Monroe, who was then secretary of state, clearly stated that the chief cause of the recall was the faith he professed—a reason which Noah could in no way find justifiable. On his return to America (1816) Noah settled in the city of New York, where he resided for the rest of his life in the enjoyment of many honors and great popularity. Primarily a journalist, he nevertheless found time to engage in many different projects; and he held successively the offices of sheriff, judge, and surveyor of the port of New York. A Tammanyite in politics, he used his pungent and fluent pen in the interest of that party. He successively published and edited the "National Advocate," "New York Enquirer," "Evening Star," "Commercial Advertiser," "Union," and "Times and Messenger." He aided financially and otherwise James Gordon Bennett when the latter established the "New York Herald." In 1819 Noah published at New York his "Travels in England, France, Spain, and the BarbaryStates," in which he very lucidly describes all his experiences abroad, the services he had rendered to his government while in Tunis, and the manner in which he was requited for his unselfish acts. Other books by him are: "Gleanings from a Gathered Harvest" (New York, 1845), a collection of essays and editorials; "Discourse on the Restoration of the Jews" (ib. 1845), and an English translation of the "Book of Yashar" (ib. 1840), which he prefaced with an article on the history of the book. During his lifetime Noah enjoyed the reputation of being the most popular American playwright of the day. Most of his plays were based upon American life and history, which fact greatly accounted for their popularity. While yet a mere youth in Philadelphia he wrote for an amateur company his "Fortress of Sorrento." His other plays, performed with more or less success, were: "Paul and Alexis, or The Orphans of the Rhine," "She Would Be a Soldier, or The Plains of Chippewa," "Marion, or The Hero of Lake George," "The Grecian Captive," and "The Siege of Tripoli." Noah's place in Jewish history is due to his activity as a Jewish liberator and nationalist. His travels in Europe and his thorough acquaintance with Jewish affairs had opened his eyes to the unfortunate situation of the Jews—a homeless people lodged in the midst of other peoples with whom they could never amalgamate. Like the majority of Zionists, Noah advocated the restoration of the Jews to Palestine, their ancient heritage; and though he firmly believed in the coming of the Messiah, he nevertheless held to the view that the restoration of the Jews must come about through the Jews themselves. That he should have attempted to found a Jewish state in a land other than Palestine is but a confirmation of the view that with all his attachment to the Holy Land, he felt greatly in doubt as to the immediate feasibility of colonizing a large number of Jews in Palestine. Furthermore, he believed that the Jews must first undergo a process of training and preparation before attempting to settle in their ancient historical home under a government of their own. What country could better serve this purpose of a temporary refuge and a place of preparation than the free, prosperous, and still unpopulated United States of America? With this purpose in view, Noah, in 1825, originated the plan of establishing a Jewish colony on Grand Island in the state of New York. With the assistance of a friend, a Christian of the name of Samuel Leggett, he purchased 2,555 acres of land for the sum of $16,985. 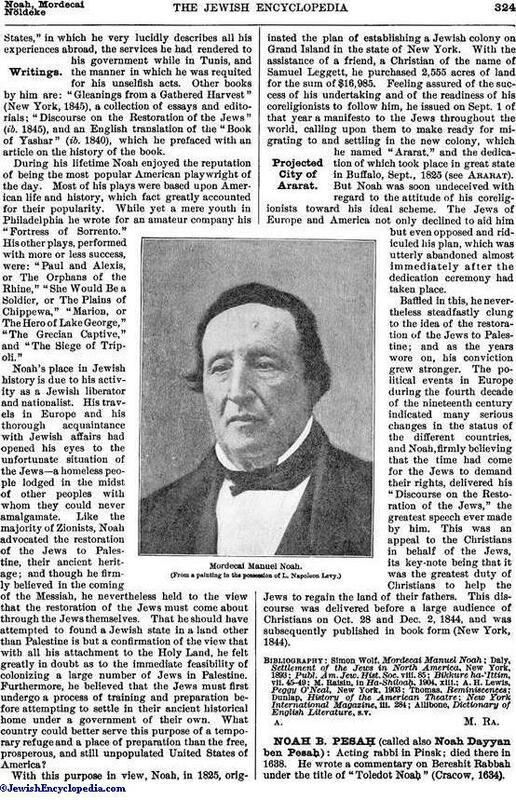 Feeling assured of the success of his undertaking and of the readiness of his coreligionists to follow him, he issued on Sept. 1 of that year a manifesto to the Jews throughout the world, calling upon them to make ready for migrating to and settling in the new colony, which he named "Ararat," and the dedication of which took place in great state in Buffalo, Sept., 1825 (see Ararat). But Noah was soon undeceived with regard to the attitude of his coreligionists toward his ideal scheme. The Jews of Europe and America not only declined to aid him but even opposed and ridiculed his plan, which was utterly abandoned almost immediately after the dedication ceremony had taken place. Bafiled in this, he nevertheless steadfastly clung to the idea of the restoration of the Jews to Palestine; and as the years wore on, his conviction grew stronger. 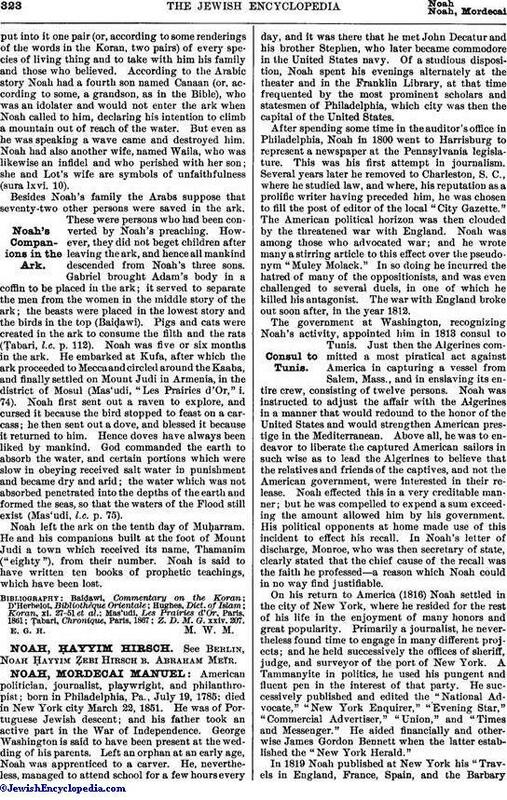 The political events in Europe during the fourth decade of the nineteenth century indicated many serious changes in the status of the different countries, and Noah, firmly believing that the time had come for the Jews to demand their rights, delivered his "Discourse on the Restoration of the Jews," the greatest speech ever made by him. This was an appeal to the Christians in behalf of the Jews, its key-note being that it was the greatest duty of Christians to help the Jews to regain the land of their fathers. This discourse was delivered before a large audience of Christians on Oct. 28 and Dec. 2, 1844, and was subsequently published in book form (New York, 1844). Allibone, Dictionary of English Literature, s.v.